Whether you are an avid runner, sit at a desk most of the day, or prefer to lift weights, anyone can suffer from tightness or pain in their Iliotibial Band (IT) Band. Many people turn to foam rolling for the IT band, but is that the most effective thing to do? 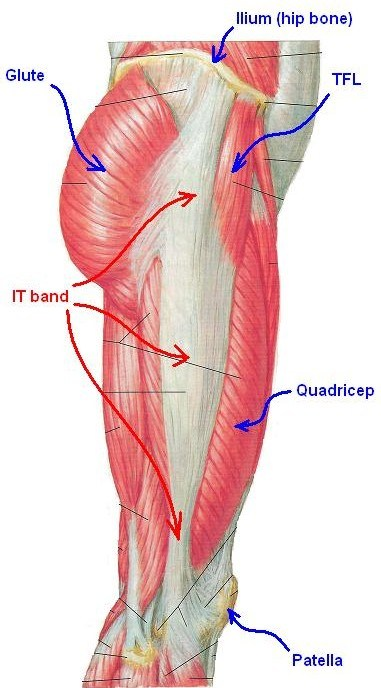 The IT Band is a piece of fascia that attaches on the lateral portion of the pelvis, Tensor Fascia Latae (TFL) muscle, and Gluteus Maximus, and progresses down the outside of the thigh and inserts on the Tibia (lower leg). The TFL and the IT Band assist in preventing the knee from moving laterally. Fascia is like saran wrap that goes from the top of your head all the way down to your feet (it is present throughout your entire body). It works with your muscles to help transmit force to various areas throughout the body. The IT band is a common source of blame for reasons why someone may have pain on the outside of their thigh and/or knee. Common complaints of “IT Band Syndrome” are pain in the middle to lateral portion of the IT Band to the outside of the knee. Keep in mind, the site of pain is often not the source. -Lack of soft tissue extensibility (flexibility) from being immobilized. If someone demonstrates one of these abnormalities, it does not mean they are going to have issues. It only typically becomes an issue when it is either micro-traumatic in nature or the repetitiveness of going into certain types of positions eventually irritates the IT Band. If someone presents with this type of positioning in a traumatic event, then there is typically some type of ligament or soft tissue compromise, usually, ACL/MCL tears, or meniscal tears, to name a few. Why does your IT Band continue to feel tight? It could potentially feel “tight” because the IT Band and/or surrounding muscles are trying to compensate and control the internal rotation of the femur and lower leg instead of properly controlling and stabilizing the lower leg. Because it’s common for people to have lateral knee discomfort, the IT band often gets blamed as the culprit, leading to recommendations to address the IT band with a foam roller, and then stretch it. Clearly, this is a misguided approach. There is sufficient evidence to suggest that the IT band doesn’t elongate , meaning you can’t really stretch it. Blaming a thickened part of fascia for lateral knee pain without consideration to other factors including ankle, knee and hip motion and control is short sighted. Just because the IT Band doesn’t elongate appreciably and likely has very little, if anything, to do with lateral knee pain, doesn’t mean using a foam roller on the lateral thigh and surrounding muscles doesn’t have value. Not so subtly hiding underneath the IT Band is the vastus lateralis, the biggest of your four quadriceps muscles. This muscle wraps around about 50% of your femur, from the middle of the front part all the way around to the middle of the back of your femur. It, like every other muscle in your body, still has blood flow. It still has neural inputs and sensory receptors providing feedback about the resting tension in the muscle. It can still develop trigger points. Does foam rolling the surrounding muscles help? ALL of these things can still be accomplished by rolling your lateral thigh, quads and glutes. You can still roll the lateral thigh area, just don’t call it your IT band. Even better, instead of rolling directly over your IT band, try rolling directly in front of it and directly behind it. This will allow you to more directly address your underlying musculature, which is ultimately what you’re targeting when you roll the outside of your thigh anyway. In summary, to “roll out” your IT band, you should really focus on the muscles that surround the IT band. For more specifics, feel free to go HERE and sign up for our special video that gives details. If you have any questions or are still having issues after trying this on your own, feel free to reach out. At Physio, we specialize in pain relief and getting you back to your life.